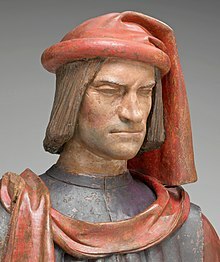 Lorenzo de' Medici (1 January 1449 – 9 April 1492) was an Italian statesman and de facto ruler of the Florentine Republic during the Italian Renaissance. He was called Lorenzo the Magnificent (Lorenzo il Magnifico) by Florentines. He was a diplomat, politician and patron of scholars, artists, and poets. He is probably best known for what he gave to the world of art. He gave large amounts of money to artists so that they could make very good artwork. When he died, the Golden Age of Florence ended. The peace he helped keep between the many Italian states collapsed when he died. Lorenzo de' Medici is buried in the Medici Chapel in Florence. Lorenzo was an artist. He wrote poetry in Tuscan. Lorenzo's agents took a lot of classical works from the east. 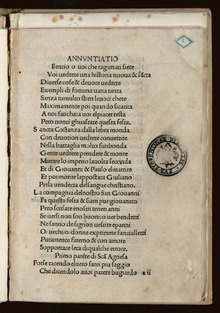 Lorenzo had a large workshop to copy his books and spread their content across Europe. He supported the development of humanism through his friends who studied Greek philosophers, and tried to merge the ideas of Plato with Christianity. In this group were the philosophers Marsilio Ficino, Poliziano and Giovanni Pico della Mirandola. Miles J. Unger, Magnifico: The Brilliant Life and Violent Times of Lorenzo de Medici (Simon and Schuster 2008), biography of Lorenzo. Christopher Hibbert, The House of Medici: Its Rise and Fall (Morrow-Quill, 1980); general history of the family. F. W. Kent, Lorenzo de- Medici and the Art of Magnificence (The Johns Hopkins Symposia in Comparative History (The Johns Hopkins University Press, 2004); summarises Lorenzo's relationship with the arts. Peter Barenboim, Michelangelo Drawings - Key to the Medici Chapel Interpretation ( Moscow, Letny Sad, 2006) ISBN 5-98856-016-4. ↑ Kent, F.W. (2006). Lorenzo De' Medici and the Art of Magnificence. USA: JHU Press. p. 248. ISBN 0801886279. Wikimedia Commons has media related to Lorenzo il Magnifico.